Up on the moor now, heading for a fave spot called 'The Windy Cross' where Chris wants to paint. It IS windy and not too warm today (12°C ). 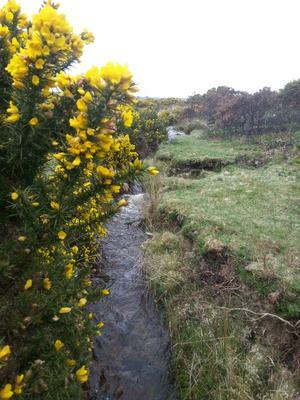 but until then we have the yellow light of the Gorse blossoms and the friendly sound of a gurgling leat to keep us happy. Yellow flowers will brighten your day. I reminisce about the beautiful gorse flowers in South Island of New Zealand when I lived there for 6 months.